At age 48, Marcel Ben-Hammo still doesn’t know what to do with his life. He lives alone in temporary lodgings, estranged from his father and especially from his sister, who is bringing up his six-year-old son on her own. Now he goes back to revisit places where he had found the intensity of life in unexpected, dramatic and at times bizarre situations. Setting out from northern Israel and traveling south, his journey is mostly to locations on the sidelines, places that Hebrew literature tends to ignore. Marcel wants to find out what has changed and whether he could find a new beginning in any of these places. The events in the past offered him life choices that he avoided, daunting as well as attractive possibilities that he was afraid to embrace. For example, he wanders around a community where the parents of a girl he was once going to marry lived; he visits the grave of his mother, who died when he was a year old; he recalls Lufti, an Arab construction worker with whom he had a close and passionate relationship. But he cannot find himself. Meanwhile, he disfigures himself, cutting himself with a knife at each stop and deriving masochistic pleasure from it. Berdugo's travel literature is excitingly different - engrossing and unique in its observations and in the existential questions it poses. Electrifying Hebrew prose of a kind that only Berdugo can produce. Through his unique, ascetic and pain-filled style, the narrator rubs against bare flesh … and gives his readers an intensive and challenging reading experience … Out of fragility and frugality, there emerges a great narrative … The character is heart-wrenching. 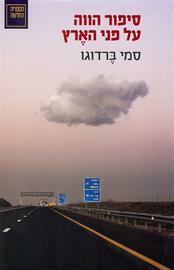 Original linguistic combinations that surprise and create a theoretical language that is unique on the Israeli literary scene. This book, consolidates even farther Berdugo’s status as a canonical author of major national importance … In his straightforward and modest manner, the hero succeeds in undermining the conventions and the ancient truths of Israel …He is the strongest weak character that you will read about this year. Berdugo has a distinctive voice, a language all his own that does not submit to the spirit of the time. Every encounter with Berdugo's work gives us so much intellectual enjoyment. There is always a rich substructure of ideas … His writing is always total and intimate as he plunges into the souls of his characters … Berdugo's poetic style is mesmerizing. It is complex, rich and compressed. Berdugo is a rare case of overwhelming acceptance in Israel … His new novel presents him at the height of his confidence as a writer. Metaphors, themes and styles that appeared in an experimental fashion in earlier works receive direct and daring – and sometimes even amusing – treatment here. A daring and irrepressible writer … Berdugo creates a new and musical world ... Its main strength is the way that Berdugo uses language to create a parallel reality … To enter Berdugo's linguistic world is like flying in a Starship Enterprise, made of words, to a place which human imagination has not yet mapped. A remarkable book … Marcel Ben Hammo is articulately inarticulate … He speaks the language of a person who is not at home in the world, a person who loses time and place, and in this there is a strange beauty. The enormous skill of the author lies in the way he gets under your skin. A sensitive and courageous journey through space-time, in poetic language, precise to a hair’s breadth and touching the depths that are the true core of that journey. Samni Berdugo writes in lucid and surprising prose and passes important stations in the history of the delicate character he has created … Berdugo invents language, exciting, innovative and unexpected. Marvelous, moving … Taking a physical and mental journey enables Berdugo to tell his story, with great courage and the most meticulous linguistic precision. Thus this book of his joins two earlier travelogues, In the Land of Israel by Amos Oz, and The Yellow Wind by David Grossman, which, in the many-sided discussion that is created between them, tell the lacerated, painful story of this land.